The Sine one has the advantage of having a very complete look. My preference is to use the aluminum face plate sold by some hifi shops or Koba in Chinatown, and just use your own outlets of your choice. Some tips for those thinking of doing this. There are two sizes, the faceplate for the single UK outlet, and the double UK outlet (same as the Sine one in JB's post). I strongly recommend the double faceplate over the single one. Both only accommodate a single US duplex outlet. The single UK faceplate has a lot of difficulties fitting the US outlet, unless you are willing to cut aggressively into the outlet. You will probably end up breaking off not just the ears, but any part of the mounting tabs projecting from the outlet body. Sine also have UK style power outlets (single and double) that have no switches. some bro have suggested Furutech GTX-D NCF (R) , any one has use this receptacle before and your comment on this. The Oyaide PC-004 requires plenty of burn-in. Not sure whether your PC plug is new ? It can sound a bit hard and brittle before burn-in. I've used Hubbell and Oyaide but not Sine in my system so I can't comment on the tone. Same here as I am going to re-install my dedicated lines very soon. I am curious about the GTX-D NCF(R)/105D/GTX Wall plate combo. Tizzy treble? There are lots of possible causes of this. There are two ways to solve it: (a) trace all the possible causes of this, or (b) cover it up. Fastest way is to do (b) but it will limit the potential of your system and will come back to haunt you when your system becomes more transparent in the future. So (a) is the best way in a long term. (2) Strong presence of EMI/RFI. Move the router as far away as possible for example. (3) vibration of equipment. One may not see or feel it but its there. (6) vibration of speakers cables especially at the speaker end. Especially true if your speaker cables are stiff and heavy. The Sine wall outlet that I used give more treble that I need...that is why think of using Furutech GTX-D NCF(R) to roll off some high freqs. But anyway after I listen to using the PS audio P10 (power regeneration unit) in some of the system...this is definitely a must have as it improves the sound in all area, bass, mid range and high freqs. Using cable along cannot achieve this kind of improvement. Very nice setup. maybe can post more pics, is the tank see through into the room? All of my cables and outlet is almost 2 years old. When I can get some kind soul to help me change the Sine back to MK, I will in a heartbeat. Though not the main culprit, I suspect it's contributing to the tizz. I could be wrong, but I read somewhere in passing, that platinum is from the same family as rhodium. Aiyah, should have gotten the gold plated one. 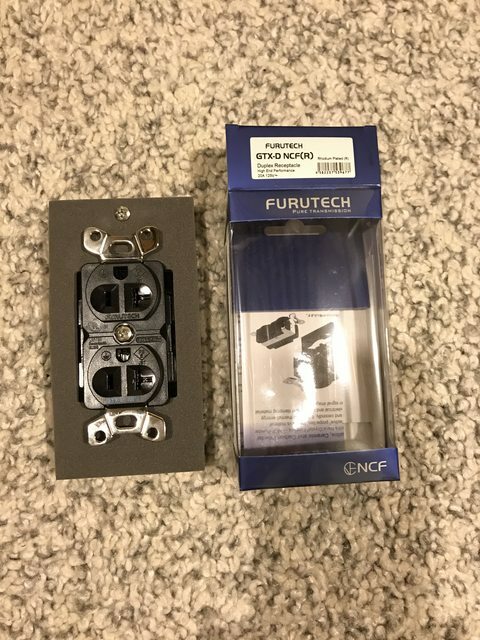 Finally bought the Furutech GTX-D NCF(R) to replace the SINW wall outlet.... will report back how the Furutech as compare to SINE after install and listen. Buy from Japan Amazon will get the cheapest price. How is this working out bro? I'm considering getting one too. However, a new one would be out of budget....so should look at a non NCF used one. The Furutech GTX-D NCF has better control of bass and it gives a very refine treble... those metal brush sound from jazz were present nicely. Overall it also has more depth. Those harsh CD I have all sound nice with GTX-D NCF. overall I will say is one grade better than the SINE receptacle in sound quality, you will not regret getting it. I am still burnt in the receptacle, and the sound start open out wider stage and vocal sound more realistic. As my outlet metal casing is built inside the wall, so I cannot use the 105D and the furutech face plate, else I think the sound will improve even further. I will implement this if I plan to run a separate power line in future.